Ralph Stanley is a bluegrass/country/folk legend and in 2002 he embarked on the “Down from the Mountain Tour” with Alison Krauss, Patty Loveless, Ricky Skaggs, and Del McCoury. This all-time collection of Americana artists made for a formidable lineup and all were reaping the rewards from the genre’s exposure in the acclaimed O Brother Where Art Thou? 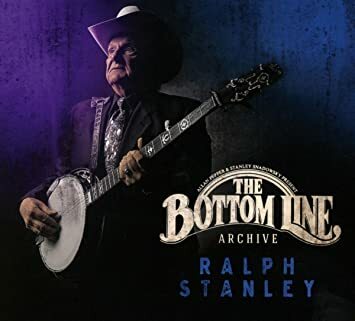 While his tour mates are phenomenal in their own right, the Doctor Ralph Stanley is the old timer head of the class and this set captured from the June 12th stop at New York City’s legendary Bottom Line is a prime example of his talents later in his life. Opening a cappella with his Grammy winning cover of the old standard “O Death” Stanley has the crowd enraptured from his first notes. Stanley’s voice is the clear focal point here, but on this night he was supported by a stellar bluegrass backing band. Stuart Duncan on fiddle, Mike Compton on mandolin, James Allen Shelton on guitar, and Dennis Crouch on bass support the Doctor with grace and most importantly know when to back out and let the legend lead. Stanley mentions that the songs he is singing on this night are 200-400 years old and he is continuing the tradition, tracks like “Girl from the Greenbriar Shore” might be ancient but it still rings true and sounds delightful in the hands of these players. Stanley blends bluegrass, country, folk and gospel into his old timey style with ease. His focus on the holy is evident on “Lift Him Up” and the especially sparse and soulful “I’ll Remember You Love, In My Prayers”. The band kicks up for the rambunctious fiddle blazing “Wild Bill Jones” and the mandolin led horror story of “Pretty Polly” which Stanley mentions he recorded back in 1948. While all of these songs are timeless, the encore plays to his strengths and enjoyment of the audience with a whooping version of “Man of Constant Sorrow” and the crowd participation of “Amazing Grace”. The show is a gem and a great way to hear Stanley riding towards the highest points in his even with a career of over 50 years behind him. Special attention should be giving to the Bottom Line Archive series which perfectly captures the music and singing on this night and is a can’t miss for any release as the quality is top notch.